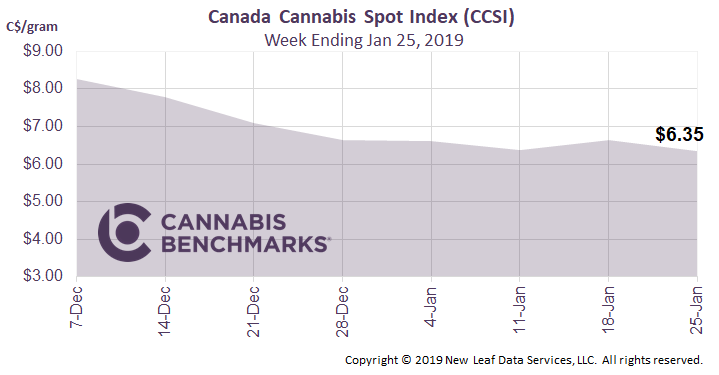 The CCSI dropped 4.5% this week to C$6.35 per gram, from C$6.64 per gram last week. The index has been particularly stable over the past five weeks, with prices bouncing within a tight C$0.29 range. C$6.35 per gram equates to US$2,164 per pound at current exchange rates. On January 23rd, Statistics Canada issued more detailed market data – the monthly retail sales by province and territory. 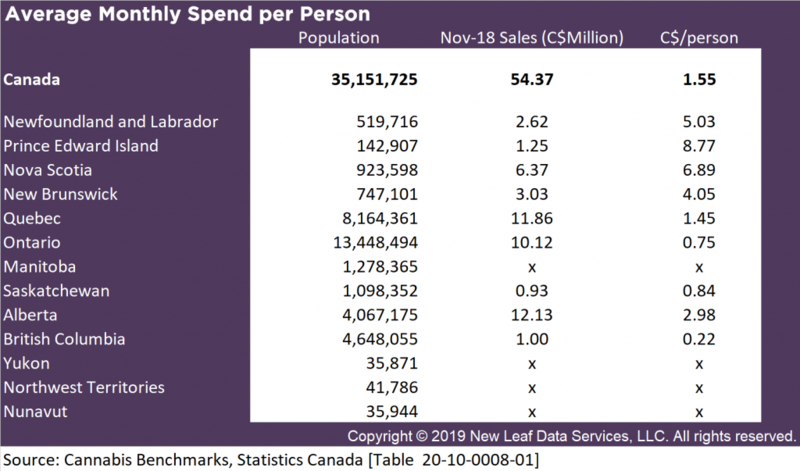 This published dataset gives us a full glimpse into a complete month of post-legalization sales from the provincial online stores and brick & mortar stores. Initial revenue figures are relatively low. November sales across Canada totalled C$54M. With recreational cannabis being legalized on October 17th, Cannabis Benchmarks made adjustments to the reported October sales numbers to normalize for a full month of sales. This takes the total sales for October from C$43M to C$89M. With that adjustment, we observe November sales dropping by 39%. 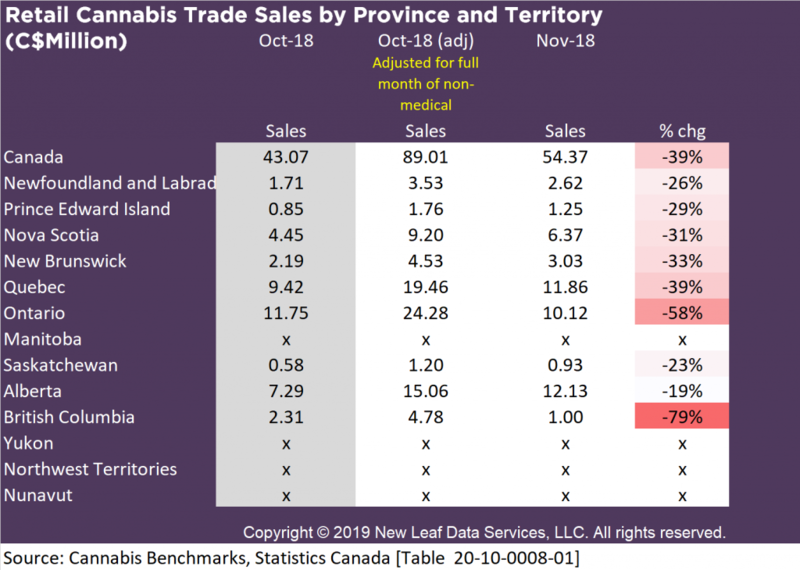 As we outlined last week, there are many potential reasons for this massive sales decline, with possibilities including October numbers being inflated by initial excitement about legalization. Alternatively, lack of product availability and high prices may have pushed customers back to the black market. The two aforementioned possibilities may also have been occurring simultaneously. Drilling deeper into the provincial data exposes even more critical information. British Columbia’s total adjusted October sales dropped by 79% to C$1M, while Ontario total adjusted October sales dropped by 58% to C$10M. Alberta was one of the few provinces that did not see massive month-on-month declines, with only a 19% drop when compared to the total adjusted October sales. Taking the analysis one step further, we broke down these figures into a monthly sales per person. These simple calculations give an even more brutal look at the start of legalization. In this analysis we assume that every Canadian citizen is of legal age and would be willing to consume cannabis. On average during November, each Canadian citizen spent only C$1.55 to purchase cannabis from a legal outlet, less than many individuals spend on a coffee. British Columbia saw the lowest spend per person at only C$0.22. 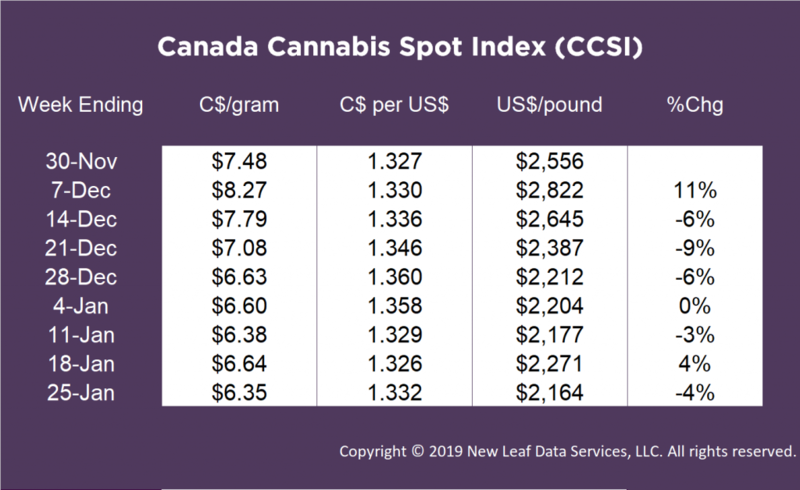 Low per-person spending figures indicate that the black market still likely looms large over the legal one in the early days of legalization in Canada.